From Kimberly Scrivener, Senior Planner, Puget Sound Regional Council. 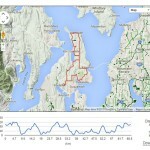 The Puget Sound Regional Council is updating the Regional Bicycle Network and looking for feedback. The Regional Bicycle Network is a set of existing, planned and aspirational connections that, once built, will connect people to regional destinations through a safe bicycling network. This is currently part of the adopted Active Transportation Plan; PSRC is updating this network to ensure consistency with recently adopted comprehensive plans and other recent planning efforts. working closely with the Bicycle and Pedestrian Advisory Committee as well as other PSRC committees and countywide groups for comment. More information about the development of the network, what is being updated, and how to submit comments can be found on the PSRC website. 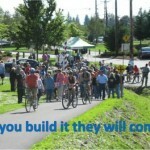 A Pierce County bike plan charrette in 2012. 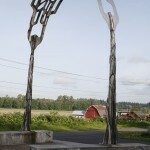 Image courtesy of Puget Sound Regional Council. What is the Puget Sound Regional Council? PSRC is the Metropolitan Planning Organization (MPO) for the Puget Sound Region which includes Kitsap, Snohomish, King and Pierce counties. PSRC is a member organization made up of the cities, counties, transit agencies, tribes and ports and is governed by boards made up of members. PSRC plans regionally for transportation, growth management and economic development. Why is PSRC developing a Regional Bicycle Network? This planning effort is part of the region’s Active Transportation Plan which is a component of the Regional Transportation Plan, Transportation 2040. Both Transportation 2040 and VISION 2040, the region’s plan for growth, call for the development of a regional bicycle network. The Regional Bicycle Network was originally adopted in 2014 and will be updated as part of the 2018 Update. More information about the development and framework can be found in section 4.4 of the Active Transportation Plan. The purpose of the Regional Bicycle Network is to highlight completed, planned and aspirational linkages that, once built, will connect people of all ages and abilities to regional destinations safely by bicycle. This effort is to highlight local planning efforts, emphasize important regional connections and provides a framework for coordinating across jurisdictional boundaries. It is also a way for PSRC to highlight important gaps in the regional system for decision-makers. What criteria were used to developed this network? PSRC spent a year during 2011 and 2012 working closely with the Bicycle and Pedestrian Advisory Committee (BPAC) and conducting outreach to local jurisdictions. The BPAC helped to identify which connections should be most considered when assessing connectivity to regional destinations. These included a focus on access to centers, major transit destinations, major parks, higher education, military bases and employment hubs as well as connections to the wider regional trail system. What kind of outreach was conducted during the development of this network? The BPAC spent many months in 2012 and 2013 conducting peer review, developing the criteria and conducting outreach to local jurisdictions and PSRC committees. This included outreach to PSRC’s Regional Staff Committee, Transportation Operators Committee and the Special Needs Transportation Committee as well as to each of the four countywide transportation committees. PSRC also hosted eight charrettes across the region where local planners and the bicycle community were invited to collaborate and discuss cross-jurisdictional connections. These charrettes in Kent, Lynnwood, Seattle, Bremerton, Everett, Tacoma and Puyallup were well attended. The final network was recommended by the BPAC in 2013 and ultimately adopted as part of the Active Transportation Plan by the PSRC Policy Boards in 2014. Is this a bike map that I can use to map my ride? No. This map should not be used as a bike map (although it does include existing facilities as a background layer). It is an aspirational network of bicycle linkages that together form a regional network connecting people to regional destinations. This article was posted in Advocacy, Alert, King County, Kitsap County, Pierce County, Snohomish County. Bookmark the permalink. Follow comments with the RSS feed for this post. Both comments and trackbacks are closed.